You will know that I am keen on encouraging wildlife in the garden and there is good news for anyone struggling to find time for all that autumn cutting and tidying. Leaving herbaceous perennials and grasses standing through the winter instead of cutting everything down to ground level provides great shelter for insects and amphibians. They will happily spend the winter at the base of the stems which keep frost and snow away and shelter them from winds. Another labour saving trick is to remove fallen leaves from lawns but simply sweep or rake them onto the surrounding beds and borders as a loose mulch between the plants. The leaves act as a blanket for bulbs as well as small creatures and protect top soil from heavy rain. If you want to help hibernating insects by providing even more accommodation, install a bug hotel too. 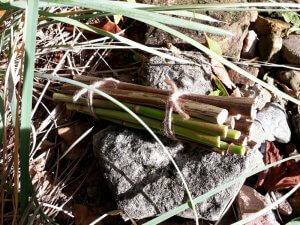 I made a simple bundle of hollow stems and some trimmings when I cut down tall shrubs to prevent winter damage. Tie them together and nestle it amongst the standing stalks for extra shelter. What could be easier or more satisfying than knowing you are supporting the creepie crawlies that form such a vital part of the garden eco-system?